SB471 Apache County, Arizona, USA The flower is large and light greenish-yellow. Origin and Habitat: This plant occurs in Northern Arizona, northwestern New Mexico, extreme southwestern Colorado, and extreme southeastern Utah, United States. The population size is of thousands of individuals. Elevation Range: 1500 to 2500 meters above sea level. Habitat: Gravely, sandy or clayey hills, canyon rims and mesas, desert grasslands, sagebrush or saltbush flats, desert shrub and pinyon-juniper communities, sometime along with Pediocactus knowltonii and Echinocereus coccineus. It is usually found singly under small bushes and is easily overlooked except when in flower. This species is very cold hardy and withstand temperatures as low as minus 23° C. It is snow covered for several month in winter. Sclerocactus whipplei has a wide range, is abundant, and occurs in protected areas, however, worth noting that part of the range where two subspecies occur is highly threatened. Grazing, oil and gas exploration are major threats to this species. Sclerocactus whipplei f. cristatus hort. 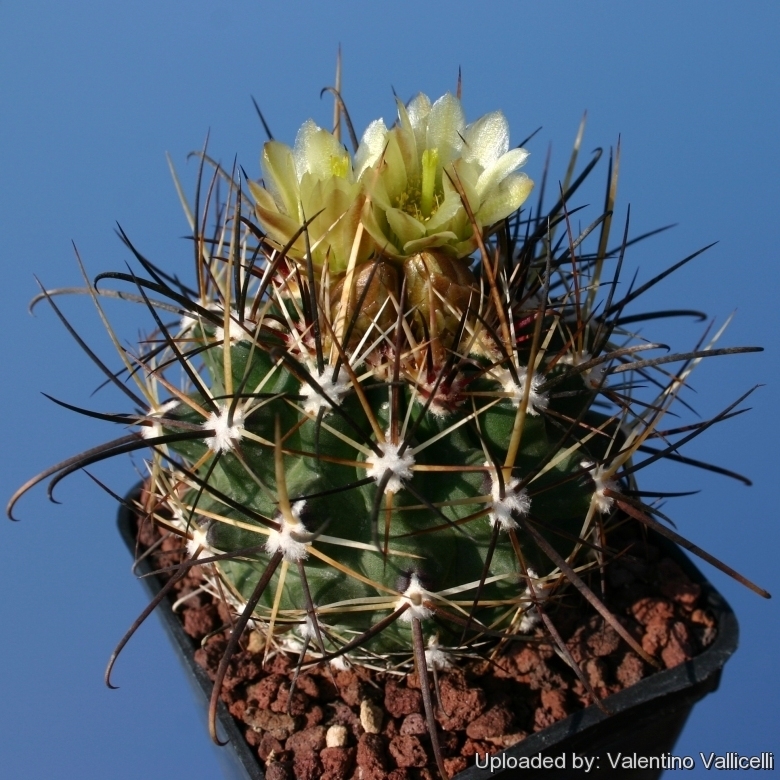 Description: Sclerocactus whipplei is one of the more distinctive species, characterized by yellow flowers and flattened, somewhat daggerlike central spine directed toward the stem apex. Similar species are Sclerocactus sileri, and the yellow-flowered populations of Sclerocactus parviflorus, often referred to as subspecies Sclerocactus terrae-canyonae. 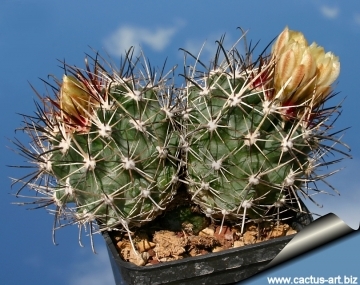 However, Sclerocactus sileri and Sclerocactus parviflorus lacks the daggerlike adaxial central spines. Two subspecies are recognized, the nominate form and subsp. heilii Castetter, P.Pierce & K.H.Schwer. Following Hunt et al. 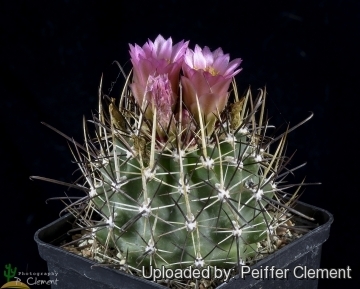 (2006) subspecies heilii includes Sclerocactus cloverae K.D.Heil & J.M.Porter as a synonym. Other authors treat this as a good species, with subsp. heilii as a synonym. 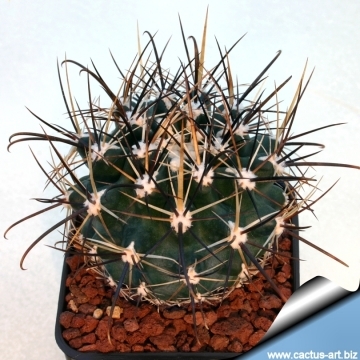 Habit: It is a usually unbranched cactus (but sometime forms small cluster) with dense spines covering the stem. Stem: 5 to 35 cm tall or more, depressed-globose, or spheric to elongate-cylindric. Ribs: (8-)13 to 15 often spiralled, prominent, tubercles usually evident on ribs. Roots: The root systems are fibrous and shallow unless deep water. 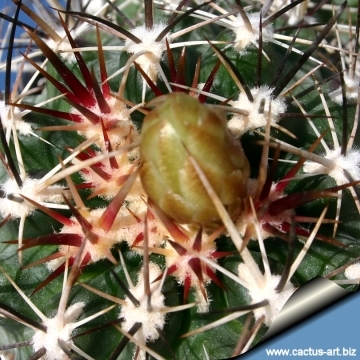 Spines: On seedlings all radials, but on old plants both radials and centrals. Radial spines: Stouter the the radials, (5-)7-12 per areole, somewhat fattened, spreading or slightly recurved, white except for abaxial 2 that are usually purplish pink to black, (6-)12-25 mm long. Central spines: 4(-5) per areole, terete to angled; The lowermost central spine 1 per areole, purplish pink or reddish brown, somewhat angled, hooked, 16-45(-55) long; lateral central spines 2 per areole, directed toward stem apex, purplish pink to white, 14-45 mm long; uppermost central spine white, usually flattened, straight, ribbonlike or dagger-shaped, 17-65(-70) long. Flowers: 3 to 5 cm long, from near the the centre of the plant, often abundant, showy; funnelform to campanulate usually yellowish (or sometime - var. roseus ?- light purple or pinkish). Outer perianth segments with greenish or reddish midstripes and yellow margins, oblanceolate, to 24 mm long and 5 mm broad. Inner perianth segments yellow, oblanceolate, to 30 mm long and 6 mm broad: Tube very short. Stamens numerous with yellow (or sometime lavender) filaments, anthers yellow. Style puberulent, ovary minutely papillate, appearing smooth. They are generally bisexual and are pollinated by insects. Fruits: Large dry or fleshy many-seeded berry, green to tan, almost naked, often reddish at maturity, ovoid, 10-25 long, 6-15 mm in diameter, scales few, yaline, scarious, margined, minutely toothed, membranous-fringed, each bearing in its axil a small tuft of hairs. Seeds release from splits in the base of the fruit. Seeds: black, 2 mm long 2(-3) mm broad, shiny, much more larger at the upper end than at the lower. Testa with rounded papillae hylum large, lateral on the lower half of the seed. 1) Butterworth, C. & Porter, J.M. 2013. Sclerocactus whipplei. The IUCN Red List of Threatened Species 2013: e.T152090A596019. http://dx.doi.org/10.2305/IUCN.UK.2013-1.RLTS.T152090A596019.en. Downloaded on 30 January 2016. 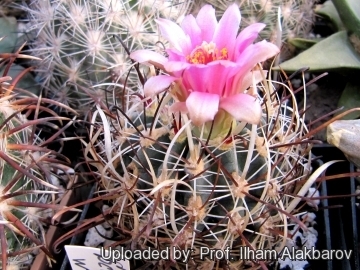 2) Heil, K. D. and J. M. Porter “Sclerocactus (Cactaceae): a revision.” Haseltonia 2: 20-46.. 1994. 11) Wikipedia contributors. "Sclerocactus whipplei." Wikipedia, The Free Encyclopedia. Wikipedia, The Free Encyclopedia, 8 Nov. 2015. Web. 30 Jan. 2016. 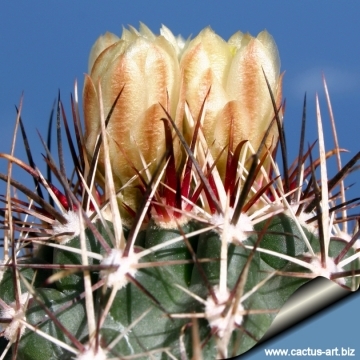 12) Weniger, D. "Cacti of the Southwest". Austin, TX: University of Texas Press.1970. Cultivation and Propagation: Rarely seen in cultivation, needs perfect drainage, it is quite difficult to grow on its own roots and to propagate. Mature individuals easily rot and die. It is indispensable to provide a greenhouse with good ventilation and a full sun exposure. Keep totally dry during winter; it can tolerate temperatures below zero (-20° C). Plants grafted on hardy Opuntia compressa stock are quite easy to grow and no special skill is required. In the spring fertilize periodically, adding a specific fertilizer. Fertilizers for succulent plants must be rich in potassium, but poor in nitrogen, to avoid the plants developing excess vegetation, which is easily attacked by fungal diseases. Water moderately during the growing season, keeping the soil dry for a few days before watering again. Propagation: Seeds are extremely difficult to germinate (only 2-3 percent of seeds germinate) The germination is really difficult and if some seedling finally sprout, as they start to grows they disappear one by one. Grafting is often used to speed growth rate and to create a back-up for plants in collection.